Primary care workforce shortages are a given in rural health care. Now rural providers—particularly in Critical Access Hospitals (CAHs)—are facing another daunting workforce shortage: technology professionals in high demand and short supply. Health care reform is driving rural providers to implement or upgrade information technology (IT) systems to convert to electronic health records (EHRs). Marty Witrak, chair of the National Rural HIT Coalition Workforce Committee, says technological success is possible for CAHs when they work together through networks and other collaborations. Conversion can cost millions of dollars for already financially strapped and staff limited CAHs, according to Marty Witrak, chair of the National Rural HIT Coalition Workforce Committee. Conversion also requires the skills of various highly trained IT professionals that are almost non-existent in rural areas. The Medicare and Medicaid EHR Incentive Programs contain strong financial incentives for hospitals and other eligible medical professions to convert to EHR technology by 2015. * For those that fail, there are also financial penalties after that date. To receive maximum incentive payments, CAHs must begin achieving the first phase of meaningful use requirements this year. EHR implementation in hospitals more than doubled between 2009 and 2011, according to Terry Hill, Executive Director of the Duluth (Minnesota)-based Rural Health Resource Center, which provides consultation to CAHs nationwide. Witrak, who says rural health is known for being inventive and creative, asserts that success is possible for CAHs when they work together through networks, partnerships and collaborations. Louis Wenzlow (l) and Kevin Glass, ITN Systems Administrator, meet at the RWHC ITN Redundant Datacenter, which houses IT experts who provide support to rural network members. Memorial Hospital of Lafayette County, one of Wisconsin’s smallest CAHs, already met meaningful use standards last year. Four years ago Memorial and four other CAHs and associated clinics, which together serve over 100,000 residents in 10 Wisconsin counties, joined the Rural Wisconsin Health Cooperative in forming the RWHC Information Technology Network (RWHC ITN), a 501(c)3 organization dedicated to providing member hospitals with shared HIS/EHR services. At that time, Memorial had almost no technology-based services or staff with technology expertise. Today Memorial boasts electronic records in lab and pharmacy, a nurse documentation system, physician order entry, medical imaging, X-ray technology and bedside bar coding. Wisconsin has also developed the Wisconsin Statewide Health Information Network (WISHIN) to help members meet meaningful use requirements using WISHIN Direct, a transport mechanism service that allows CAHs to conduct their Stage 1 test of information exchange by pushing summary care records to other providers. Wenzlow, a member of the WISHIN Technical Advisory Committee, said WISHIN is working on a query-based exchange that will help providers meet Stage 2 requirements and ultimately give them secure access to patient medical records no matter where these patients are treated in Wisconsin. Fifteen of 17 California CAHs that grouped together as CAReHIN Network two years ago are on target to meet meaningful use standards by the end of this year. The hospitals and their clinics, which provide 75 to 100 percent of care in their rural service areas, received funding through a HRSA Rural Health IT Network Development Program grant. 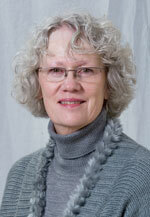 Network Administrator Lynn Barr negotiated contracts with vendors. She then stipulated that those vendors provide project management to ensure that each CAH member had the necessary technology and that all components interfaced properly throughout all departments. SISU, a network based out of Duluth, Minn., offers 17 CAH members technical equipment, human resources support and cost savings through group purchasing and volume discounts. Associate members and other clients can purchase certain services. SISU has also developed a database to do public health tracking and other support functions required in future phases of HIT implementation. 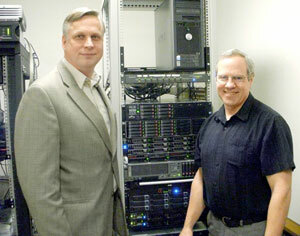 The Tahoe Institute for Rural Health Research (TIRHR), a nonprofit corporation of the Tahoe Forest Hospital District, where Barr works, was one of three health care organizations that partnered with Butte College in Orland, Calif., to develop the Rural Hospital Incumbent Worker Health IT Training Program. Twenty-one California hospitals enrolled 138 staff members in online courses such as IT Project Management, Workflow Analysis, Change Management, and Data and Health Information Exchange. 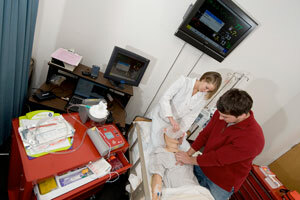 The College of St. Scholastica offers four different programs in Health Care Informatics and Information. St. Scholastica also partners with the Cerner Corporation to use EHR in a hands-on environment as a teaching and learning tool. Even with federal assistance, these leaders worry that EHR conversion will force hospital closures with many of these hospitals being the only providers in their rural areas. Good strategic planning needs to become part of every plan, Hill said. Many hospitals that are meeting current standards have severely underestimated the technical savvy and financial commitment that maintenance requires. According to Barr, their network analysis of costs to maintain their program severely threatens the hospitals’ financial viability. Rural hospital employees already fill multiple roles and there is a limit to how many jobs can be filled from within, Witrak said. While community college programs are an important step in the right direction, they don’t negate the need for four-year training in advanced IT professions. The Bureau of Labor Statistics estimates that by 2020 the number of IT jobs in the United States will increase by 21 percent, making it even more difficult for rural providers to recruit IT professionals. CAHs are already significantly behind in meeting standards compared to urban counterparts, Hill said, and CAHs’ financial incentives are significantly less proportionately than that of urban hospitals. Hill has talked to CAH administrators who say hospital implementation is so complex and expensive that they see no choice other than eventually closing their doors. Still, all these leaders agree that EHR implementation will vastly improve patient care and delivery in rural America. Hill predicts that failure to convert to EHR will also force hospital closures because new physicians will demand the technology. * All information regarding legislation is current as of April 24, 2012. The RHIhub and the National Rural Health Resource Center have developed an online HIT Toolkit (no longer available) that will serve as a pilot program for providing health information technology (HIT) resources to rural health care providers. The toolkit is designed to help rural providers find resources for HIT, electronic health records (EHR), meaningful use and related topics. This entry was posted in Features and tagged California, Closures of healthcare facilities and services, Critical Access Hospitals, Health information technology, Health information technology workforce, Health workforce supply and demand, Healthcare business and finance, Healthcare workforce, Hospitals, Minnesota, Technology for health and human services, Wisconsin on May 17, 2012 by Rural Health Information Hub.